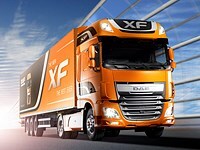 DAF introduced its new flagship Euro 6 XF model at the Hanover truck show. The new XF will enter production in Spring-2013. DAF design criteria delivered maximum transport efficiency, resulting in industry leading low operating cost and optimized vehicle performance, DAF claim. The Euro 6 DAF XF includes a new chassis, a fuel efficient Euro 6 PACCAR MX engine, an aerodynamic exterior design and a modern spacious interior. "DAF's significant investment in the new Euro 6 XF reflects the company's strategic growth plan, driven by its excellent operating performance," shared Harrie Schippers, DAF president and PACCAR vice president. "This is the most comprehensive engineering design and development program in DAF's 84 year history." New Euro 6 PACCAR MX-13 engines design criteria included a B10 design life of 1.6 million kilometres, fuel consumption at low Euro 5 ATe level and maximum performance of up to 2,500 Nm torque at low engine speeds. Other considerations in the design process were optimized weight for maximum payload, new chassis design, efficient component layout and a large fuel tank capacity up to 1,500 litres. Low operating cost considerations were long service intervals up to 150,000 km, new ATe solutions, including excellent cooling and optimized air flow, new rear axle and new gear ratios and Driver Performance Assistant (DPA) as standard on all versions. Building on the excellent reputation for reliability and efficiency, the PACCAR MX 12.9L engine has earned in Europe and North America, DAF has developed a new generation of Euro 6 engines. The PACCAR MX-13 engine features state-of-the-art technologies and proven technical innovations. The use of common rail fuel injection technology, a variable geometry turbo, and efficient exhaust gas recirculation (EGR) ensures excellent fuel economy and vehicle reliability. The advanced exhaust gas after treatment system contains a DeNOx catalytic converter and active soot filter (Diesel Particulate Filter) and was developed to achieve maximum efficiency. Use of passive regeneration is optimized during the engines operating cycle to further improve fuel efficiency. The new PACCAR MX-13 Euro 6 engine is offered with outputs of 300 kW/410 hp, 340 kW/460 hp and 375 kW/510 hp and high torque outputs from 2,000 to 2,500 Nm, available across a broad engine speed range (1,000-1,425 rpm). A new, lighter rear axle is available for combination weights of up to 44 tonnes and engine torques of up to 2,300 Nm. A Stabilink suspension structure incorporates the function of the anti-roll bar, reducing weight and providing a high level of stability and excellent handling. A new fifth wheel mounting plate and smart positioning of the battery boxes result in additional weight savings. The new steering gear is mounted on a multifunctional casting, eliminating the need for a separate steering box mounting bracket. Targeting maximum efficiency, DAF focused on providing the best layout for the completely new chassis. The standard 90-litre AdBlue tank (140-litre tank optional) is positioned under the cab and the batteries can be positioned to the rear inside the chassis. Combining the DeNOx system and the soot filter into a single unit makes it possible to provide fuel tank capacities of up to 1,500 litres for a maximum operating range. Additional enhancements include new rear mudguards and a redesigned closing cross-member for the chassis. The New DAF XF delivers highest level of driver comfort the moment you step inside. By cleverly installing the engine and cooling system in the chassis, the height of the cab floor has remained virtually the same. This ensures excellent accessibility with only three aluminum steps positioned in a 'staircase' style. The low cab floor makes the XF Super Space Cab the most spacious cab on the market with a total volume of more than 12.6 m3. The low cab floor also contributes to the excellent field of vision. The interior of the XF features many significant enhancements. The new PACCAR seats offer a wide adjustment range to provide an even greater degree of comfort. The position of the pedals has been revised to include a hanging brake pedal for maximum ease of operation and more foot-well space. The steering wheel has been redesigned, along with the new central information panel on the dashboard, which features new functionalities and a new color screen. The large screen has high clarity, making it very easy to read. The instrument panel has been redesigned with attractive aluminum accents around the dials. New high visibility switches which have been re-grouped by function, make the controls easy to operate. Other new additions include the two cup holders fitted in the central part of the dashboard and a waste bin adjacent to the driver. The door panels have also been redesigned. These can be fitted with optional aluminum inlay which is also used on the passenger side of the dashboard. DAF has improved its market-leading sleeping compartment by extending the primary mattress (160 mm deep) to 2.20 meters. A new multifunctional control panel, coupled with new storage space is located on the rear wall. The DAF XF features Vehicle Stability Control as standard, which helps to prevent jack-knifing and roll-over. Adaptive Cruise Control and Forward Collision Warning are optional, as well as an Advanced Emergency Braking System. The dashboard is equipped with shock-absorbing zones providing an ergonomic driver work environment. The new, energy-absorbing cab suspension and the reinforced cab structure with pre-programmed front and rear crumple zones provide industry leading vehicle safety and passenger protection. The bumper, made from galvanized steel to enhance durability, has also been designed contributing to the truck's aerodynamics and engine cooling. The new DAF XF is introducing a number of innovations that blend perfectly with the Advanced Transport Efficiency (ATe) programme, which lowers operating costs and reduces environmental impact. Examples of these innovations include the optimized cooling system, which means that the fan is required less often, as well as, the new rear axle ratios and the use of optimized cruise control, which gradually returns the vehicle to the previously set speed. The innovative Driver Performance Assistant (DPA) is an excellent example of DAF's fuel efficient ATe philosophy. The central display on the dashboard provides the driver with detailed information on real time fuel consumption, which optimizes driver performance. Messages appear automatically on the information screen that can improve driver efficiency by recommending shifting to a different gear. The DPA provides advice on how the driver can save fuel and operating costs by ensuring correct ty­­­­re pressure and air deflector position. The DAF XF is one of the first vehicles in the industry to offer LED headlight technology (optional) for impressive light output, providing extra safety, as well as a long service life and lower energy consumption. Also new are the 'cornering lights' that shine in the direction of travel while turning and manoeuvring. Daytime running lights (LED) ensure extra visibility during the day. Aerodynamics is also a key focus of the new design, including the addition of new side skirts, fenders, mudguards and the new roof deflector for the XF Space Cab. The height of the roof deflector can be adjusted quickly and easily by the driver. Mudguards and fenders have been completely redesigned, along with the new deflectors on both corners of the front of the cab which guide the airflow to keep mirrors and door handles clean. Click here to find DAF trucks for sale. Click here to find new specs for DAF trucks.